I like cooking brisket. Smaller briskets, not those 15 pound packer briskets. You gotta wake up in the middle of the night to cook those things. I need my sleep. That’s why smaller briskets work out best for me. The preparation was simple. Dry rub the brisket, then wrap it in foil for a few hours. I did not feel like firing up the smoker, so I used my Weber Charcoal grill. I set it up for indirect heat by foiling most of the bottom grate. Then I put a piece of steel, held upright with a couple of firebricks on the grate. This keeps the coals neatly stacked on one side while allowing the smoke and heat to drift over to the meat side. I then added a foil water pan under where the brisket will go. And added coals. The firebricks and water filled pan act as a heat sink to help maintain the desired temp of the grill. The water also helps to keep the meat moist while it cooks. Nothing worse than nasty dried out brisket. I put the brisket on the grill and inserted the temperature probe. Now I used my Igrill which has 2 temperature probes. So I used one for the meat, and one for the grill temp. To get an accurate grill temp the probe cannot be laying on the metal grate. I also like the probe to be at the same height as my meat. That is why I use a potato. Slide the probe through the potato at the right height and angle, and you got yourself a pretty slick probe holder. Which you can eat when the meat is done. Now I ran my brisket up to 195 degrees. I then pulled it off the grill and foiled it as it rested for a while. 195 gives a very tender brisket. Once everything else was ready, I sliced the brisket. It was good. Too bad there were no leftovers. Maybe I will make one of the big ones next time. Sleep is overrated. Rub the dry rub on the meat. Beautiful! I love cooking on the kettle. Thanks for the images showing how you set up your kettle for slow cooking. Thanks Steve. Taking pictures and posting them was way easier than trying to explain that whole set-up. Amen to that! And good, clean pictures at that!! I’ll be giving this a go over the weekend and might borrow your rub recipe. 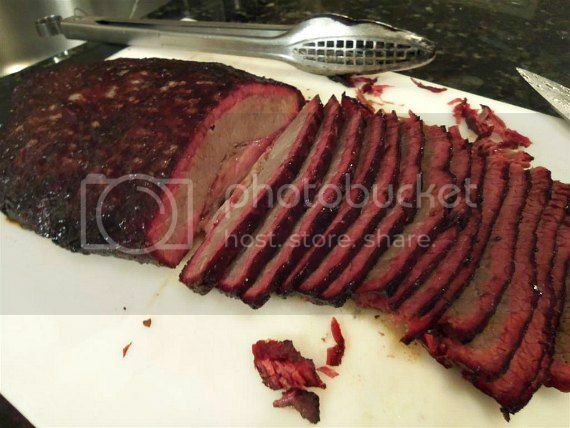 My daughter and grandson love brisket and Mother’s Day sounds like an excellent excuse. The rub works well. Its a simple mix, but sometimes simple is best. I cooked a small brisket that day, normally I plan ahead and cook a big one. Then I use the leftover brisket in my chili recipe. Makes for some tasty chili! HAH! That’s what I did last time and my wife yelled at me for putting excellent meat into a chili! I have to say though, it was really good chili! !